Bridget and Raymond Allchin’s account of a year of archaeology and travel in India, Pakistan, and Afghanistan in 1951 is an unusual combination of history, anecdote, memories and observation, switching between the voices of the authors. It opens with some extraordinary recollections of their early lives: Raymond throwing an (unopened) tin of tomato soup at his sister; dancing naked on the windowsills of their Ealing home on a hot summer evening; his first experiences of India and of learning Hindi as a serviceman in WWII; and watching an excruciating fire-walking ceremony in Singapore; Bridget falling headfirst into a stream at their Scottish farm while hunting for caddis-worms; teaching their South African cook to make drop-scones; witnessing the rise of Apartheid; and flying planes in the Orange Free State – including pulling out of a spin as part of her lessons, and the shopping trip with her instructor that required her to fly the plane back to his home, so laden down with food and drink that he had to sit outside, behind the wing. 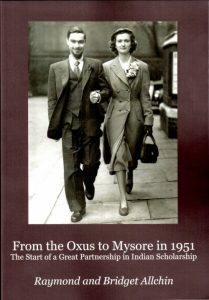 They go on to describe their respective degrees, and their meeting at a lecture by Frederick Zeuner at the Institute of Archaeology, and the ex-serviceman’s grant that would cover Raymond’s year of leave to study the South Indian Neolithic: a grant that would also cover the fare of his wife, should he have one. Thus, Bridget and Raymond married after knowing each other for six months, and left for India together not three months later – after finding out, to their surprise, that they were expecting a baby. Episodes such as this and many others, recounted with understatement, make it a funny book, revealing much about the personalities of the pair, as well as making a serious contribution to the historiography of archaeology in India. Raymond’s gentle humour comes across as he describes reciting parts of the Rig Veda while saying grace at a Churchill College dinner; and Bridget’s tenacity is apparent throughout – the aplomb with which she copes with becoming a mother while in India is considerable; as is her determination, when rather unceremoniously left alone in Kabul, to photograph the entire contents of the Kabul Museum. The main body of the book describes their adventures in Afghanistan, Pakistan and India, many of which involve their trusty Austin pickup and rivers in flood. Of the many friends and colleagues they make and meet along the way, most prominent is the somewhat suspicious figure of Raymond’s PhD supervisor, K. de B. Codrington (K. de B. ), who simply refuses to allow Bridget to accompany he and Raymond to northern Afghanistan; makes injudicious radio broadcasts about the Pashtun desire for independence; commandeers their car for mysterious purposes in Calcutta; and is at one point described as ‘a man with an unrivalled ability to discover and create problems’! What is clear throughout, however, is that these two (very) young postgraduate students were of the highest intellectual calibre, and many of their observations, records and discoveries were ground-breaking – and continue to have a profound impact on our knowledge of the archaeology of India today. Their passion for the people, food, landscapes and archaeology of the Indian subcontinent is abundantly clear: Bridget comments, upon their arrival in Bombay, that ‘India was taking us over’. And how. Oh Anna – What a wonderful review. I was laughing so hard the tears came — I guess that’s because, fortunately, I’ve had the privilege of knowing both of them. You have yet another fine talent. : Writing humorous interpretations of life. Well done. I think I will read your review again right now..